All smart bulbs carry premium price tags, with color variants more expensive than their white counterparts. 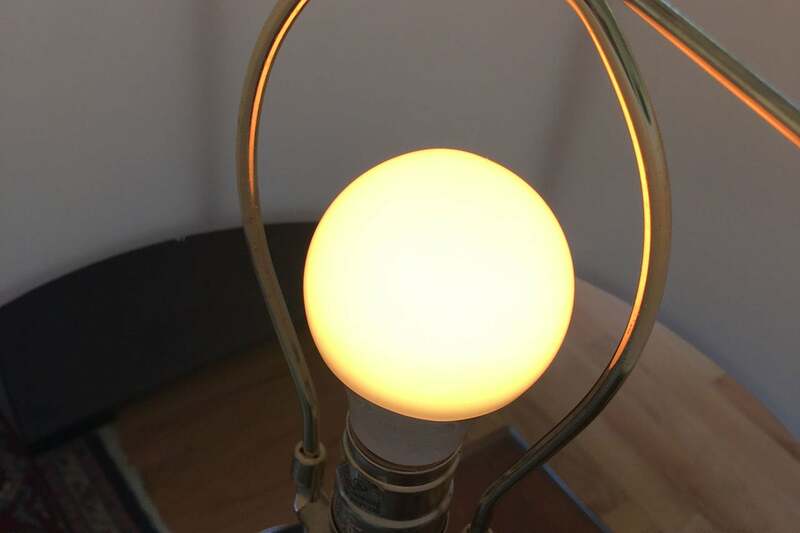 Merkury Innovations is bucking that trend by hanging $25 price tags on both its Lux (white) and Prisma (color) series Wi-Fi smart bulbs. You’ll see these marketed under the company’s Geeni brand name. 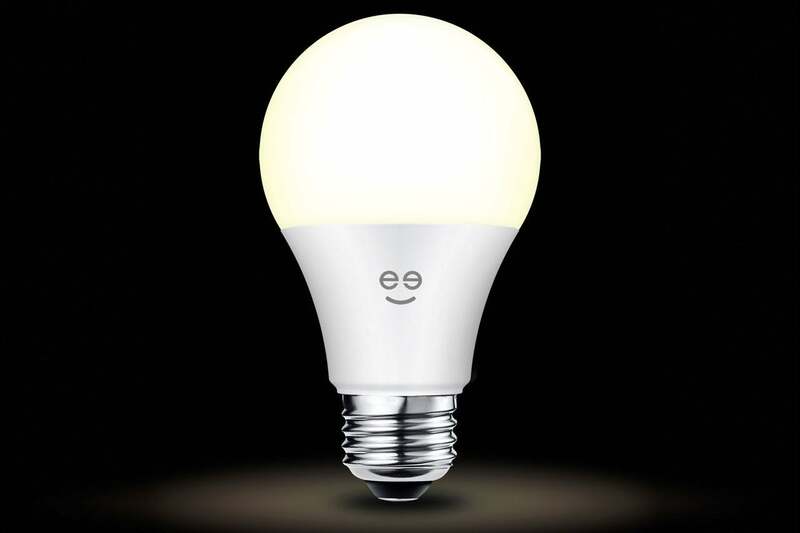 Four separate bulbs are available in the Edison-style A19 form factor alone. Those include the Lux 800, a dimmable (but not tunable) white bulb; the Lux 1050, a higher-power, white-tunable bulb; and the Prisma 450 and Prisma 1050, both color-tunable bulbs of varying brightness. The Lux 800 and Prisma 450 were tested and are reviewed here. The Geeni Lux is a dimmable white LED. The Geeni bulbs (as well as their companion products, a smart plug and a security camera) are Wi-Fi enabled and can be used without a hub. 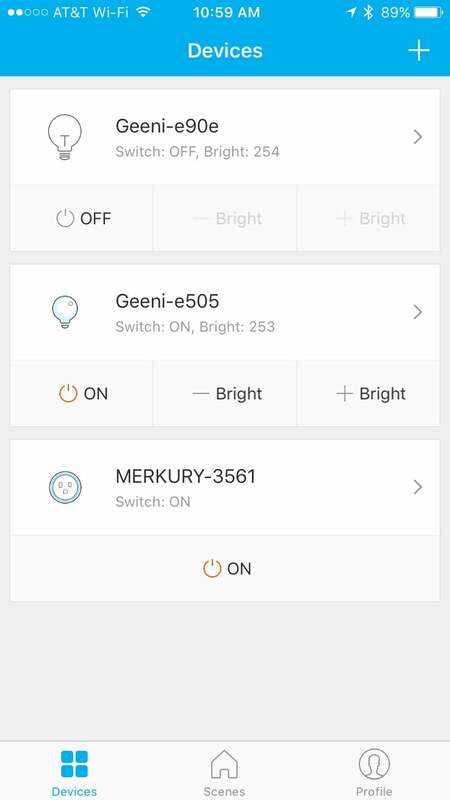 As such, installation is extremely easy: Download the Geeni Android or iOS app, screw in the bulbs, and provide your Wi-Fi password. An account, tied to your phone number, is also required (Geeni sends you a one-time setup code via text message). Even this first-time setup doesn’t take more than a few minutes, and adding additional devices is even faster. Geeni’s app is decidedly simplistic, the centerpiece being a master list of all your Geeni devices appearing on a single screen. Bulbs can be switched off or on or dimmed directly here, without having to drill down further. If you do venture into the individual bulb configuration page, you’ll be able to adjust the light properties with more detail. In the case of the Lux 800, that means merely dimming. For the Prisma 450, an added color wheel lets you choose your preferred hue as well as the “coldness” of the light. This dim orange hue is the Prisma’s “party” scene. Can you feel the excitement? 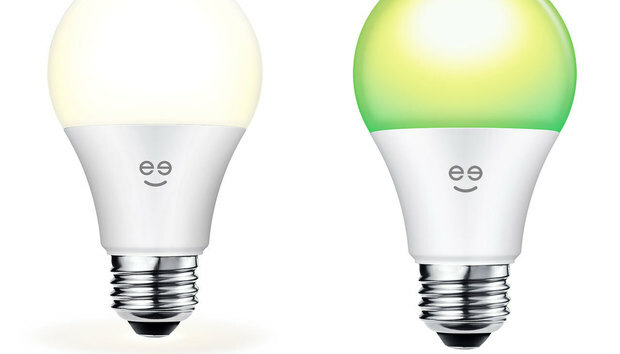 Both bulbs also offer a rudimentary scheduling system that can be used to set when the lights go on or off, but it can’t be used to automate color or brightness changes. For the Prisma, a handful of simple preset scenes are available, but these aren’t particularly useful nor are they very appealing, unless you fancy the idea of quickly flashing through six colors, over and over again. A simple home screen interface lets you control lights and set brightness for individual bulbs. The app confusingly offers a separate system which is also called “scenes,” but here you can tie devices together (e.g. if Bulb A is turned on, then turn Bulb B on, too) or set lights to go on or off with sunrise or sunset. The former works fine, if clunkily, but the latter didn’t work at all in my testing, giving me an error of “location obtaining failed” when trying to determine my whereabouts. The good news: These smart bulbs are compatible with both Amazon’s Alexa and Google’s Assistant, so you can also control them with voice commands. As for the bulbs themselves, the Lux 800, pre-tuned to 2700K, offers plenty of warmth and, even at a mere 60-watt equivalent, is bright enough to easily read by. The Prisma 450 is a different story; with just 45 equivalent watts, it’s suitable for little more than accent lighting. Geeni’s bulbs do not work with external dimmers, which is a common shortcoming with smart bulbs. When I unplugged one of the test lamps for just a few minutes, the bulb reset and had to be manually reconnected to the app, which is disconcerting. The Echo and Google Home integrations are a nice touch, and these bulbs are very cheap, but you’ll find that Wi-Fi bulbs from a number of other vendors that not only have more features, but that have more of their kinks worked out, too.